Production, shooting and editing of a 3-minute video profiling the first ever schools' preview of a major exhibition at the National Portrait Gallery. Includes dynamic visual documentation of the students' exploration of works by Picasso, as well as interviews with students and teachers . The video is presented on the National Portrait Gallery's exhibition website and the Gallery's YouTube channel. The assignment also included the production of 2 Learning Resource Videos, in which the exhibition curator provides an introduction to the exhibition, and explores key works on display. Watch the 3-minute Schools Preview video below. Shooting and editing of four 4-minute videos offering different perspectives on the ﻿National Portrait Gallery﻿'s Van Dyck Self Portrait: Van Dyck: The Man, the Artist and His Influence, Van Dyck's Self Portrait in the Collection, The Conservation of the Painting, and The Frame and Its Conservation. The videos are presented on the National Portrait Gallery's website, the Gallery's YouTube channel, as part of the online collections page for the painting, and at the museums where the painting will be exhibited on its current national tour. Watch the 4-minute video on the conservation of the painting below. Or click here to see all four films on the National Portrait Gallery's website. Shooting and editing of a 3-minute video announcing Hans Ulrich Obrist's planned Interview Marathon for EXPO CHICAGO 2018. Obrist, who is Artistic Director of the Serpentine Galleries in London, will be presenting the Marathon as part of the Terra Foundation's Art Design Chicago initiative. The Terra Foundation has partnered with the Chicago Humanities Festival, EXPO CHICAGO and Navy Pier to produce and present the Marathon. The video premiered at Expo Chicago 2017, and has been featured on web pages and social media channels for both Art Design Chicago and the Terra Foundation. It has also been used to brief journalists and has supported the writing of articles on the upcoming Marathon, such as this piece in ARTNEWS. Watch the 3-minute video with Hans Ulrich Obrist below. Shooting and editing of a 4-minute video profiling the Family Workshops offered by the ﻿Royal Academy of Arts﻿. The video is used by the Royal Academy to promote the workshops to families. Watch the 4-minute video below. Anna Moore, Acting Curator of Sculpture at the Victoria and Albert Museum, discusses her research into the late Georgian wax portraitist Samuel Percy (c.1750—1819), conducted with the support of an Understanding British Portraits Bursary in 2014/15. The film includes a demonstration of the wax modelling process that Percy might have used in the eighteenth century. The videos is presented on the Understanding British Portraits Network website﻿﻿﻿, and the National Portrait Gallery's YouTube channel. Watch the 6-minute video below. Pamela has also produced a video profiling the research and outputs of the 2016 Understanding British Portraits fellows. This project involved location shooting of interview and B-roll content at The Fitzwilliam Museum, Cambridge, Royal Pavilion & Museums, Brighton and The Stanley & Audrey Burton Gallery, University of Leeds. The client says: "We had a limited budget and timescale for the production of the video with Anna Moore. Pamela managed the project with immense professionalism and ingenuity. The video was very well received by the Network’s professional membership and my National Portrait Gallery colleagues. On the strength of this excellent work, I engaged Pamela for a larger project, to focus on the outputs of our four Research Fellows. For both projects, Pamela was consistently proactive in applying her broad creative experience in meeting our needs. Pamela’s professionalism ensured that our (sometimes first-time) interviewees were put at ease before and during the filming, As I’ve also worked with other filmmakers for our media requirements, I know that such levels of experience, commitment to a project through all its stages, and quality of work are not to be taken for granted." Conceptualisation, sound design and editing of 30 different audio portraits of iconic locations surrounding Anish Kapoor's sculpture the ArcelorMittal Orbit. Each of the 40-second audio loop portraits is played at a different position on the 400-step stairwell; as visitors descend from the Orbit's viewing platform, they walk through a soundscape evocation of locations such as Columbia Road Flower Market, Theatre Royal Stratford East, Mudchute Farm, Whitechapel Bell Foundry and The Olympic Park's Velodrome. The creation of the audio portraits involved custom recording and careful composition of the most evocative sounds captured at each site. The visitor's imagination is inspired to envision key locations that surround the Orbit. 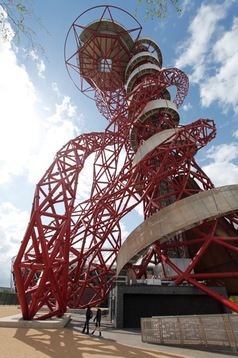 The launch of the soundscape coincided with the opening day of the Orbit as a visitor attraction in the Queen Elizabeth Olympic Park. The Soundscape received a nomination for Audio Installation of the Year in the 2014 AV Awards. Listen to samples of the 40-second audio portraits by selecting from the images below. Watch a 2-minute video below, describing this unique soundscape project. Video produced by Saville Audio Visual, who were responsible for the hardware and installation for the project. The client says: "We were impressed with Pamela’s creativity and her ability to overcome obstacles. Obtaining access to make the recordings and sourcing some of the archival materials were incredibly challenging. But Pamela always seemed to find a way to get the piece we were after. Following the attraction’s re-opening, we conducted a comprehensive review of visitor feedback. The soundscape Pamela created for us was the most consistently mentioned and praised element of the interpretation by far." 2-minute web videos documenting the conservation of the painting 'Gallery of the Louvre' . The painting is the cornerstone of the collection of the Terra Foundation for American Art. Interviews were shot on location with curators at the Louvre and the conservators responsible for the restoration in their studio. The video programs are part of a multi-year post-conservation tour of the painting, beginning with an exhibition at the National Gallery of Art, Washington, and continuing through 2017 at venues such as the National Academy of Design and Huntington Art Collections. The film is also ﻿featured on the Terra Foundation's website﻿ and YouTube channel. British University Film and Video Council. View a 3-minute preview version of the film below. HD Video for the new amphibian display at London Zoo. The presentation profiles conservation work undertaken by ZSL scientists working to save the Mallorcan midwife toad, and was shot on location in Mallorca. The video is presented on a large 48-inch screen, in association with printed didactic displays and a window that allows visitors to view scientists at work with live animals. The video intentionally has no sound, so that it can be successfully incorporated with the other exhibition elements.